Waking up to muggy tropical rainfall was quite a change this morning compared to the blizzard that greeted me forty-eight hours ago. After a spectacular breakfast of fried eggs, bruschetta, papaya, muffins, fresh orange juice, and coffee, we boarded the bus to drive into Central Havana. 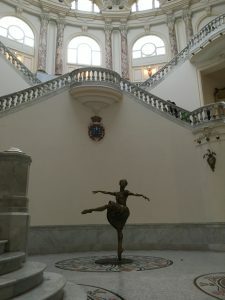 “El Gran Teatro de La Habana Alicia Alonso” was one of the most beautiful buildings I have ever been to. Marble could be seen everywhere one looked and it was a place which fostered the arts. The building’s theater was newly renovated, and our tour guide told us a plethora if information about its history. It is strange to me how Cuba prioritizes its restoration projects, and its aid to citizens; theaters get renovated before some neighborhoods or roads. I imagine it all has to do with the image of the nation, its history, and its need to rejuvenate itself. 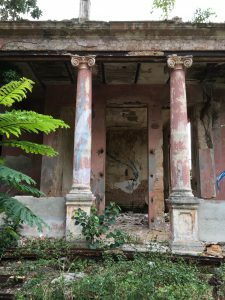 The difference between seeing the regal and palace-like theater, then walking through Vedado on our tour with our guide, Ana, was rather unbelievable. Both places were a juxtaposition of beautiful and expensive restoration, and then crumbling buildings that were empty and overgrown. Never before have I been to a place where the difference between the rich and the poor are so highly visible. Yet here, I would not necessarily have expected it to be so, because of the country’s communist politics and the fact that everyone receives money from the government. Although it is not a large sum, and certainly not enough to live on, I would have imagined that the stipend would lend a different outcome. I find it sad that many people make only enough money to survive, and not to maintain their homes or neighborhoods from further deterioration. Nevertheless, the things which I encounter here make me ponder Cuba’s rationale for restoration. Knowing that Vedado was once the neighborhood of mostly professionals and other affluent figures, it is amazing to acknowledge this with much of what I have seen, while still appreciating the eerie beauty that it brings in its current state – despite its disrepair. I try to imagine what it was like in its prime, and how glorious it was compared to the rich, yet desolate forms which remain today. The chipping paint and crumbling stucco draw me in unlike many of the things I see around home. All of the scenes we pass are eye-catching to me, but the deteriorating architecture grabs me like nothing else. Perhaps it is the abstraction of the things with which we are so familiar. We, as students from Lowell, encounter very few dilapidated buildings compared to what we see here in Havana, and certainly not to the same extent. Peeling paint versus crumbling stucco aren’t exactly on the same parallel, never mind the complete collapse of a home or business. Seeing those forms in their rubble-like state due to disrepair, weather, and neglect are reminders of what it takes to maintain a nation governmentally, yet also physically. In some ways, Lowell and Havana share similarities in their histories. Both were once places of innovation, growth, wealth, and development. Lowell during it’s years of industrialization and the Industrial Revolution, and Havana after its independence from Spain. These cities bloomed with business and population, growing and expanding more than ever. They were the pride and joy of regions, and they were cared for by those who sought value from them. However, both eventually fell into disrepair, never (yet) to make a full recovery. Lowell still struggles with its image as a dangerous city, and Havana still crumbles as much as it is restored. As I walk around Havana, I cannot help but see similarity after similarity between Lowell and Cuba. Both places have managed to harness nature’s powerful waterways in engineering feats such as the Malecón (a massive sea wall in Havana) and Lowell’s many canals from the Merrimack and Concord rivers. The cities strive to make themselves better, more attractive, and restore themselves to their prior glory, yet the element of their peril still remains. In Cuba, it’s the collapsing buildings, disjointed sidewalks, and flooding streets. In Lowell, it’s the nearly constant sirens signaling crime or danger, shady neighborhoods, and bumpy roads. While the cities are making great strides in repairing themselves, their pasts still linger as a reminder of what was. Cuba has been absolutely fascinating to me so far, and I cannot wait for what will come.